The concept of Amateur Radio is communication between people from all over the world. Amateur radio, commonly referred to as HAM radio consists of enthusiasts, passionate about technical aspects of radio equipment, communication transmission and reception. The hobby begun early 1900's where the first official call signs were issued and handed out. There are almost 700,000 Amateur Radio operators in the USA and over two million in nearly every country in the world. Ham radio operators use two-way radio stations from their homes, cars, boats and outdoors to make hundreds of friends around town and around the world. They communicate with each other using voice, computers, and Morse code. Some hams bounce their signals off the upper regions of the atmosphere, so they can talk with hams on the other side of the world. Other hams use satellites. Many use hand-held radios that fit in their pockets. Please read on to know a little more about this wonderful hobby. Requiring an Amateur Radio license essentially requires that you learn which frequency bands are available for amateur radio and agree not to use other frequencies. It also requires that you learn radio etiquette so your operation on the amateur bands won't interfere with other amateurs. Exams are usually administered by volunteer examiners, generally a group of friendly Ham Radio operator from a local Ham Radio club. Exam sessions are held regularly all across the world and the licenses are issued by the communications department in your country. There are popular ham radio license study guides online to help you learn the things you'll need to pass your exam and have fun with Amateur Radio. Self-study - It doesn't seem right to tell you about going it alone, because then you're not doing it all by yourself! 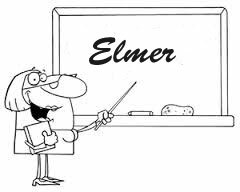 Taking a class or having an Elmer is a far better way to get your license; and when you pass your test you will already have friends to talk to. When you're ready to take your exam, you'll need to locate an exam session near you. At the end of the classes, a test is given. If you pass, you're a licensed ham! There are usually different levels of licenses and requirements are more involved the higher the license. The operator should know the basic radio theory but for higher level exams, there are usually technically difficult radio theory questions. Most people who are interested in amateur (ham) radio and short wave listening will want to set up their own station to be able to participate in the hobby. In the early days of radio, these rooms were called radio shacks, and this term has stuck, and is used today for a room where the ham radio equipment is contained. Here is where you will find Transmitter, Receivers, Transceiver, Switches, Log book, Microphone, Rotator control, Power Amplifiers, SWR (Standing Wave Ratio) measuring devices etc. Amateur radio call signs are allocated to amateur radio operators around the world. The call signs are used to legally identify the station or operator. Today the International Telecommunication Union (ITU) allocates call sign prefixes for radio and television stations of all types. 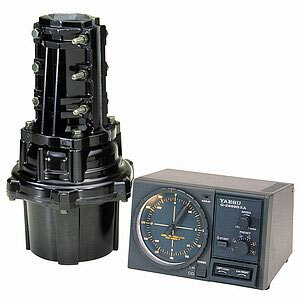 Since 1927 these have been used to uniquely identify operators and locate amateur stations within a geographical region or country of the world. 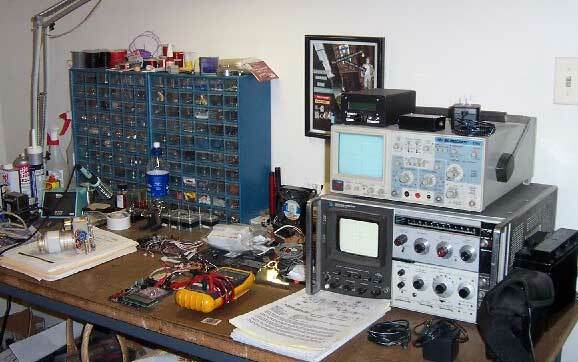 The main hardware of any Ham Radio shack is the so called Transceiver or "Rig". 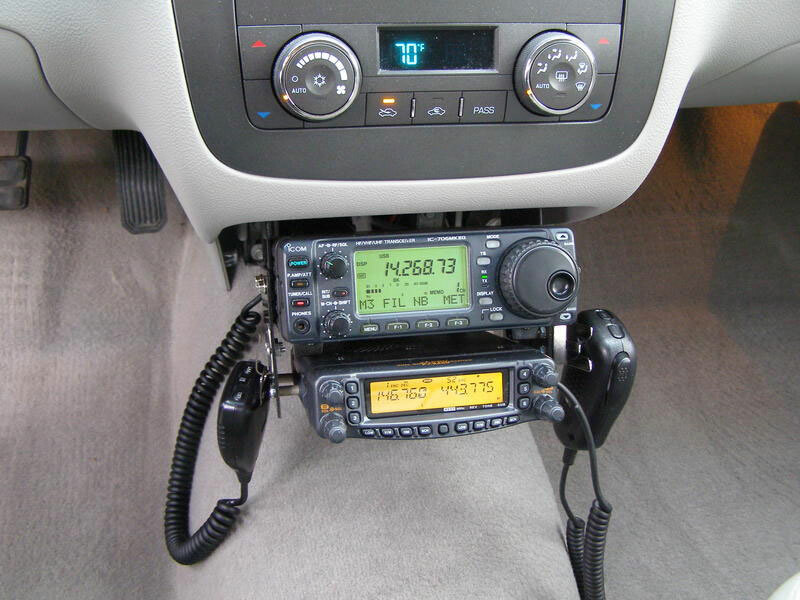 The 3 biggest rig manufacturers are Yaesu, Icom and Kenwood but there are other brands such as Elecraft, Elad, Flex Radio, Alinco, Baofeng and Wouxun. Prices vary between 1500 USD for a budget rig to expect somewhere around 10.000 USD for the biggest flagships. There are of course a lot of second hand to choose from where you can find a good work horse for around 200 USD. 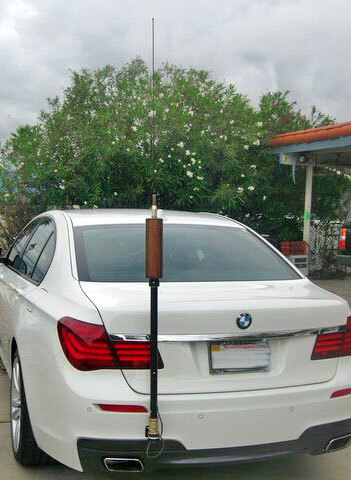 The Amateur Radio Antenna is really one of the most important parts of the Ham Radio set-up. The antennas can be directional or omni-directional. An example of a directional antennas called Yagi is shown in the picture. Antennas are mostly made out of aluminium but can also be made out of wires. Directional antennas require a rotator which is an indoor control unit that sets the antenna direction. 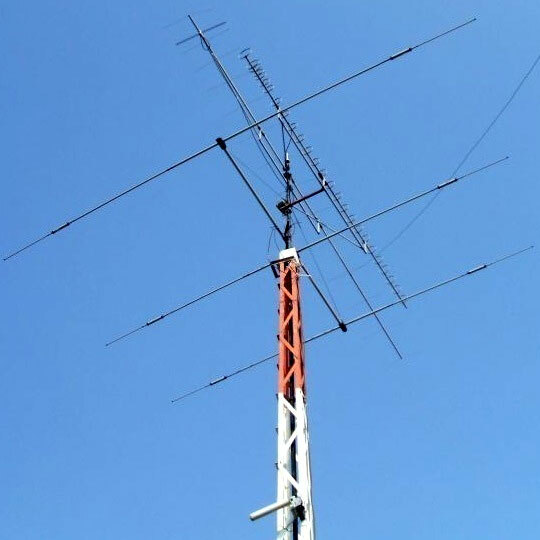 Antennas have always inspired operators to achieve other goals within the amateur radio world, such as design, electrical skills and other areas of design. Things they might not have thought about tackling before. Every Ham Radio station is required to keep a log book. 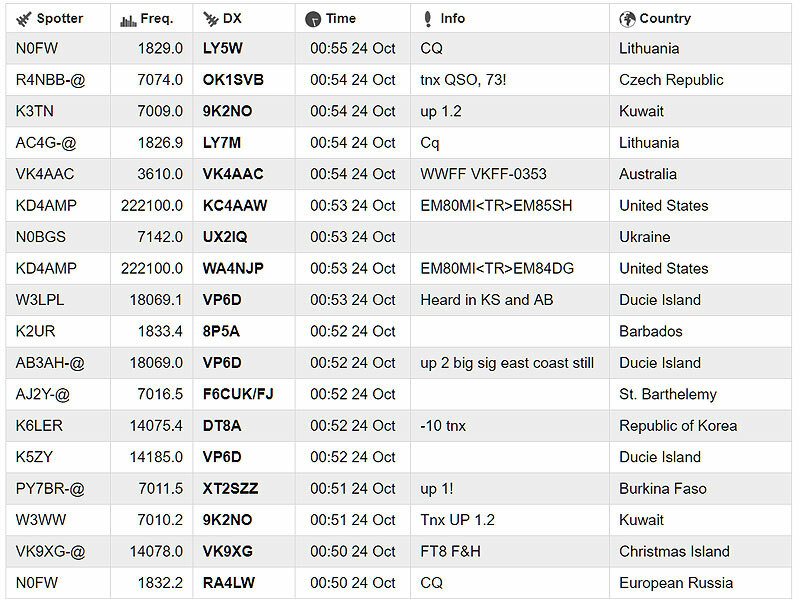 Each contact is logged by UTC time, Callsign, Frequency, Report, Mode etc. This used to be a paper log book but has been replaced by software in many shacks. 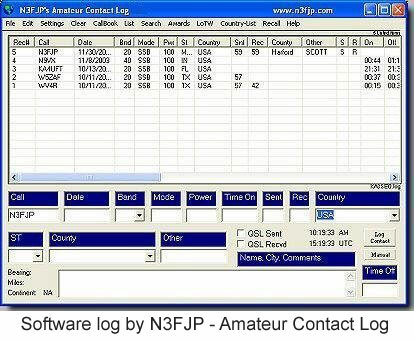 There are a myriad of Ham Radio logging software available. Some log software interfaces with the transceiver to make the hardware send frequency and reports back to the program. 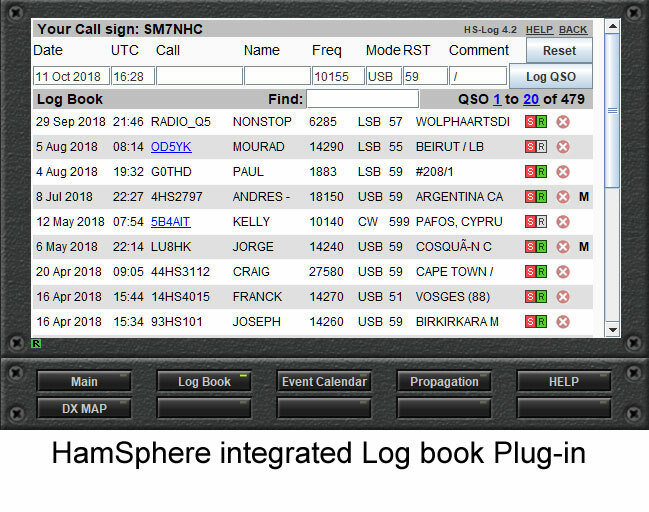 Some software such as HamSphere has built in software log books. Today ham radio operators send QSL cards for a variety of reasons. It is interesting to collect them. 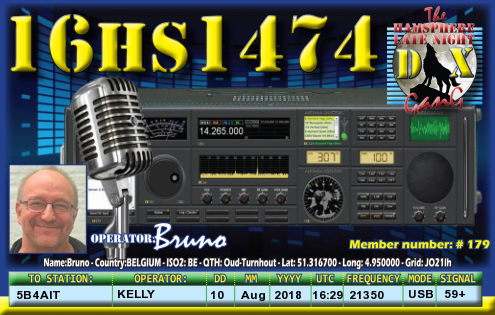 Having made contact with a particular ham radio station it is often nice to have a card from them to remember the contact. 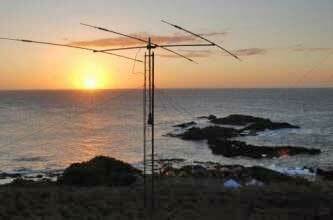 It may be a particularly interesting contact, or one with a rare country where few ham radio operators are active. 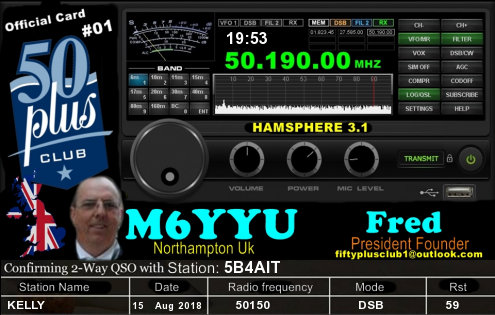 Electronic QSL cards can be sent through systems like eQSL or HamSphere. Elmers - An elmer is the ham equivalent of a "Yoda." Many new hams are taught by other hams. (Helping people is a common thread throughout the ham radio hobby.) An elmer knows the stuff you need to pass your test and will help you prepare. While an elmer can not give the FCC examination, he or she will be in touch with other hams in your area and know where public examinations are held. 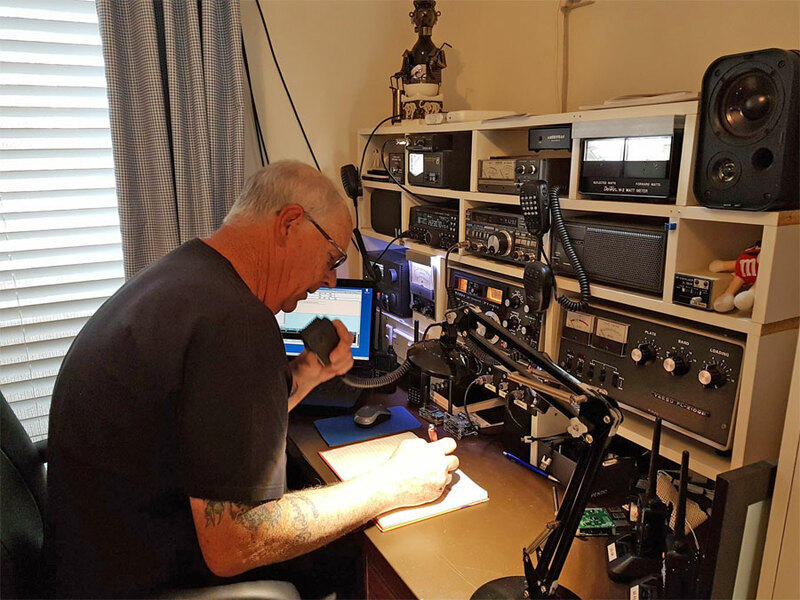 Elmers welcome new members to the Ham Radio hobby. The purpose of Amateur Radio Clubs is the promotion of interest in Amateur Radio communication and experimentation through education in the field of wireless electronic communication. The primary goal of a club is to help students earn their license! 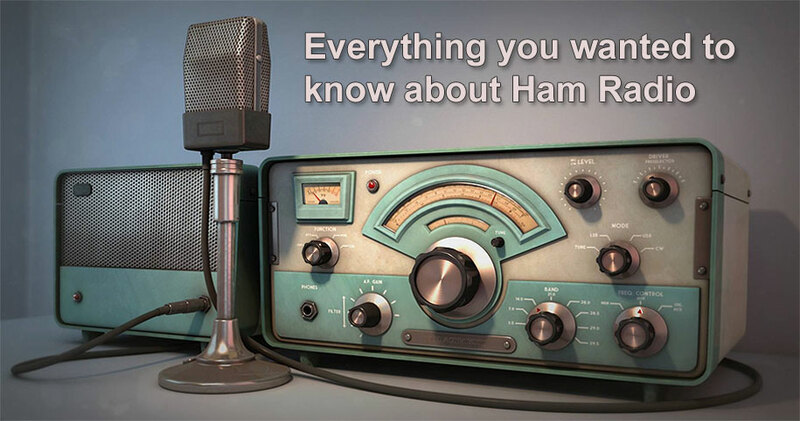 Hams talk with other amateur radio operators across town, across the state, across the country, and even around the world. Many clubs organize meetings and classes to teach the basic skills of radio operation and prepare people for their ham radio license test. Getting started in Amateur Radio has never been easier. First, locate a radio club in your area. Some radio clubs offer ham radio licensing classes, or they can find a club volunteer to answer your questions. You may even be invited to attend a local radio club meeting. 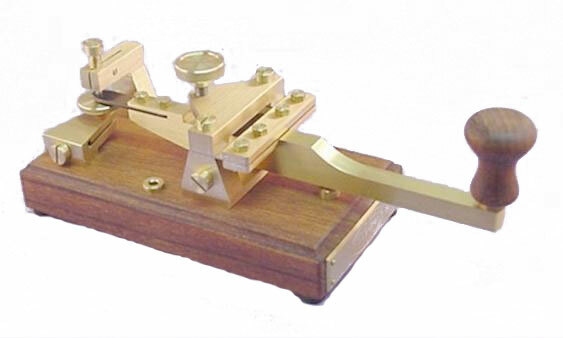 Morse code is the original communication mode and it is more than 140 years old. It was developed by Samuel Morse and Alfred Vail in the 1840s. Ham Radio uses Continuous wave (CW) to transmit Morse code. It is a character set consisting of short and long keyed tones in a sequence. Amateur radio frequency allocation is done by national telecommunications authorities. Globally, the International Telecommunication Union (ITU) oversees how much radio spectrum is set aside for amateur radio transmissions. Individual amateur stations are free to use any frequency within authorized frequency ranges; authorized bands may vary by the class of the station license. Frequencies between 0.1-30MHz are normally reflected by the Earth's Ionosphere under certain conditions meaning that distant communication via skywave/skip can be used daytime for frequencies 10-30 MHz and 0.1-10MHz during nights. 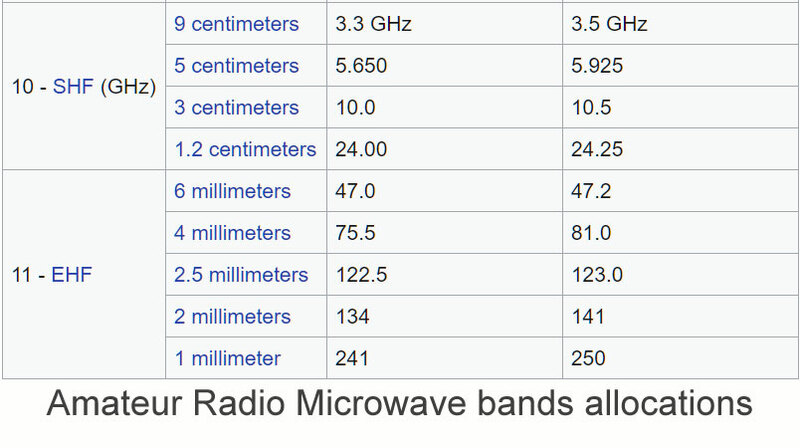 The table below lists all valid Ham band within the radio spectrum from long wave to millimeter waves. Frequencies above 30 MHz do not normally bounce off the ionosphere unless there is a phenomenon referred to as Sporadic E. VHF/UHF frequencies are usually limited to ground wave conditions set by the Earth's curvature. Here is a table of the ITU standardized Amateur Radio frequencies. Please note that every country has their own implementation/limitation of these frequencies. So please check your local frequency allocations before you start transmitting. The Q-code is an international set of abbreviations that was created at the beginning of the last century to simplify radiotelegraph communication. Each code is composed by three letters always starting with Q. Each code can be a question if followed by a question mark or an answer (or statement) if not. To avoid confusion, no station call-sign begins with Q. Even if initially designed for telegraphy, it's also used in voice communications. 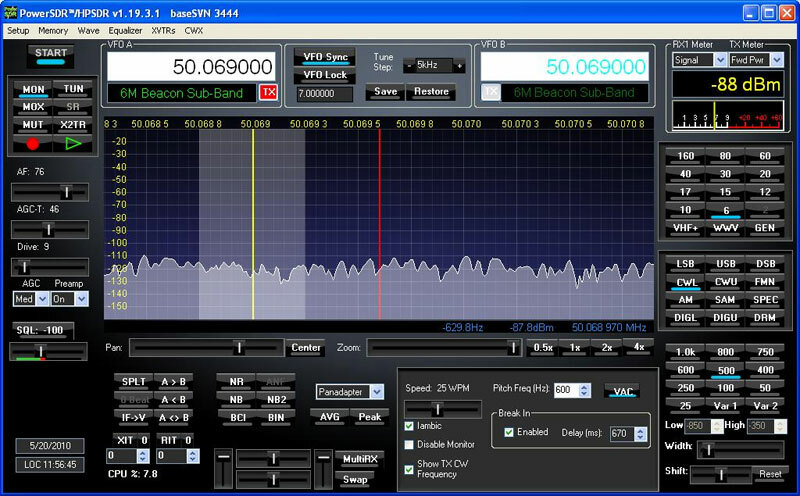 The RST system is used by amateur radio operators, shortwave listeners, and other radio hobbyists to exchange information about the quality of a radio signal being received. The code is a two or three digit number such as 59 for Voice or 579 for CW, with one digit each for conveying an assessment of the signal's readability, strength, and tone. The International Telecommunications Union, ITU has adopted a phonetic alphabet for use with radio transmissions. Also called the International Phonetic Alphabet, this one has been adopted by other organisations including NATO. The radio phonetic alphabet is widely used for radio communications, and also even for communications over the telephone lines and the like. It is not just a hobby but can also be a lifeline in emergency situations such as earthquakes, floods, etc. Over the decades of amateur radio many lives have been saved by the skills of radio operators when there has been no telephone link or internet. In times of crisis and natural disasters, amateur radio is often used as a means of emergency communication when wire line, cell phones and other conventional means of communications fail. In USA and Canada Amateur Radio Emergency Service (ARES) is a corps of trained amateur radio operator volunteers organized to assist in public service and emergency communications. Jamboree on the Air (JOTA) is the amateur radio element of JOTA-JOTI, with Scouts all over the world speaking to each other by means of amateur radio. Scouting experiences are exchanged and ideas are shared via radio waves. It is an international Scouting and Guiding activity held annually on the third full weekend in October. First held in conjunction with the fiftieth anniversary of Scouting in 1957, it was devised by Leslie R. Mitchell, a radio amateur with the callsign G3BHK. JOTI stands for Jamboree On The Internet. Shortwave Ham Radio communication relies upon the refraction of signals from layers of gas hundreds of kilometers above the Earth's surface (known as the ionosphere)! These layers of gas are 'excited' when the Sun shines on them, changing their characteristics: some of them become more reflective to radio signals when subject to solar radiation whereas some start to absorb radio signals. This is why some short-wave frequencies are good for night-time reception and others for the day-time. Sunset and sunrise present some other interesting opportunities as both the night-time and day-time layers of ionization begin to swap over. This complex interplay of radio signals and layers of the Earth's atmosphere is usually termed 'propagation'. There are a few tools that the ham radio operator can use in order to predict shortwave propagation. As the phenomenon is based on Sun spots and solar flux, the propagation quality usually goes in cycles. The sun spot cycle is 11 years and we are currently on a minimum making shortwave communication difficult at the least. The American broadcaster Voice of America made extensive research in their quest for better reception of their signals around the world. Their research is now in the public domain and is called VOACAP www.voacap.com which is a rather accurate prediction tool. The "gray line" is a band around the Earth that separates daylight from darkness. Propagation along the grey line is very efficient. One major reason for this is that the D layer, which absorbs HF signals, disappears rapidly on the sunset side of the grey line, and it has not yet built upon the sunrise side. 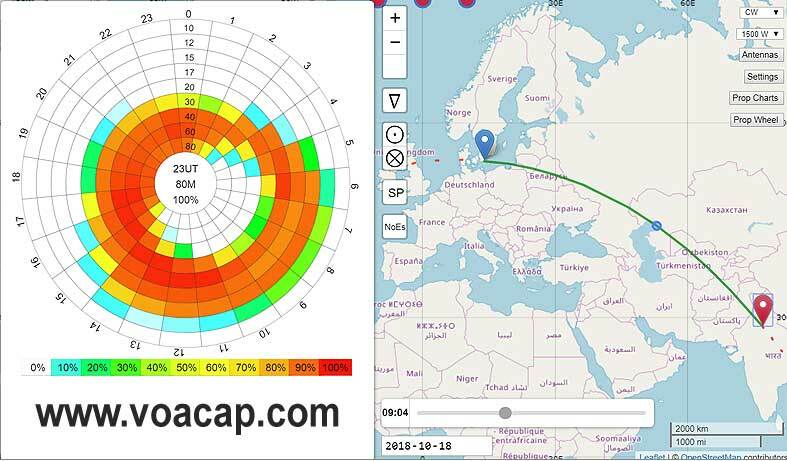 Ham radio operators and shortwave listeners can optimize long distance communications to various areas of the world by monitoring this band as it moves around the globe." "Gray line" happens at dawn and dusk, following the north-south path. Since you are on a single point of the globe and are moving, the time-frame is short. Transmitting east-west is not gray line. The D layer is thin-to none, while the F2 layer is still fairly strong, giving you long distance hops. 30 Meters is probably the best band to try this on. An almost ever-present condition that brings in distant fluttery signals beyond normal line-of-sight. Scattering of the signals occurs in contact with discontinuities in the troposphere. These discontinuities can be small temperature or humidity variations, such as can be found around cloud layers, individual clouds, updrafts, downdrafts, the tropopause (the boundary between the troposphere and the stratosphere), small particles and droplets such as drizzle, mist, haze, dust, smoke, volcanic ash, etc., or even flocks of birds and large swarms of insects. The "Ducting" effects occur primarily because of temperature inversions at a height of between 500m and 1500m, and occasionally up to 3000m. Signals that reflect off of a water surface instead (ocean/lake) retain much more strength. In some cases Ham Operators can work over 1000km on VHF/UHF via ducting. 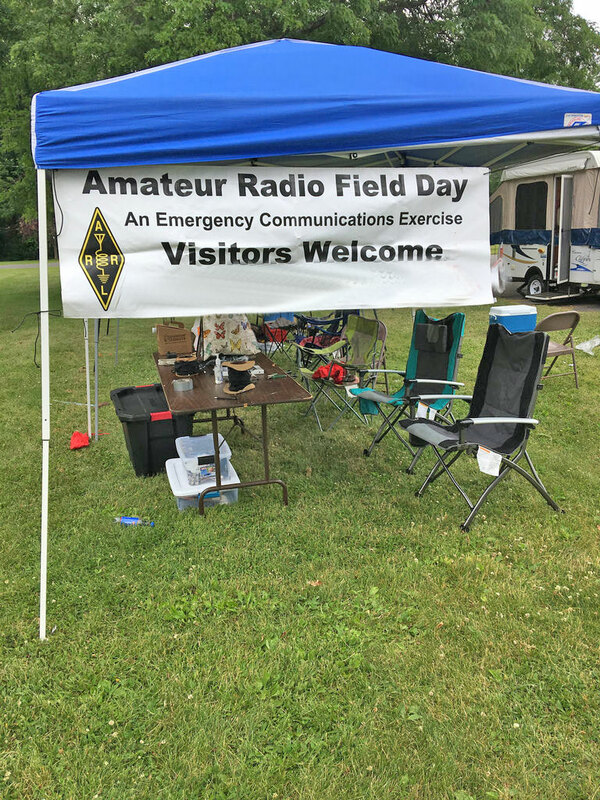 Field Day is ham radio's open house, a picnic, a camp-out, practice for emergencies and ham radio communications. Operators set up temporary transmitting stations in public places to demonstrate ham radio's science, skill and service to our communities. It combines public service, emergency preparedness, community outreach, and technical skills all in a single event. This event remains the most popular event in ham radio and, most of all, it is FUN! Hamfests are events organized by amateur radio enthusiasts, for social gathering and promotion of the amateur radio hobby. 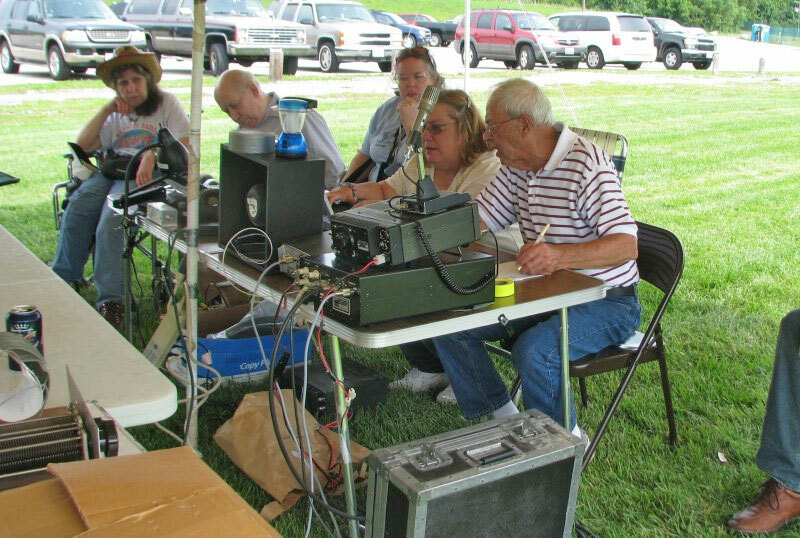 Hamfests offer exhibits, forums, and fleamarkets for Amateur Radio operators. In the United Kingdom the term rally is more commonly used for amateur radio conventions. "Hamfests" were noted as early as 1924 in the USA. The Dayton Hamvention in the US is generally considered to be the world's largest hamfest in the world. It is held each May. 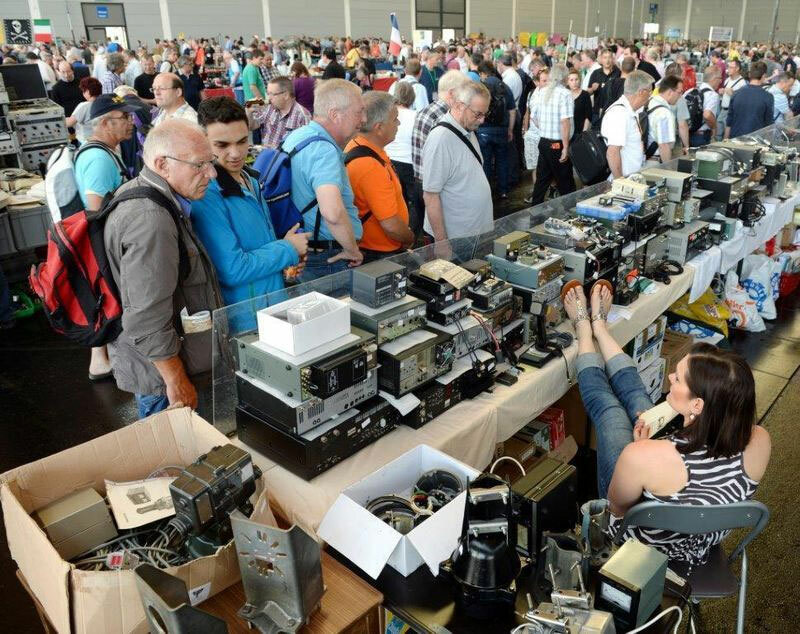 The International Exhibition for Radio Amateurs known as HAM RADIO in Friedrichshafen, Germany, is Europe's largest and most well-known hamfest (17,080 visitors in 2015) which includes a trade show and "youth days". The first HAM RADIO took place in 1976 with 62 exhibitors. Contesting is a competition for amateur radio operators. In a contest, an amateur radio station, which may be operated by an individual or a team, seeks to contact as many other amateur radio stations as possible in a given period of time and exchange information. 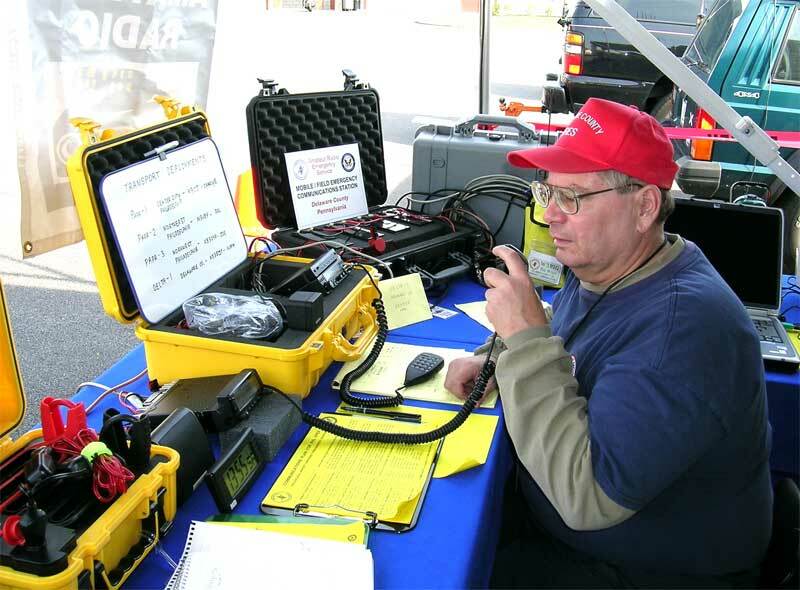 Rules for each competition define the amateur radio bands, the mode of communication that may be used, and the kind of information that must be exchanged. The contacts made during the contest contribute to a score by which stations are ranked. Contest sponsors publish the results in magazines and on web sites. An exchange of information is necessary during each contact. You may be required to send and receive a serial number, location, name or even a person’s age. 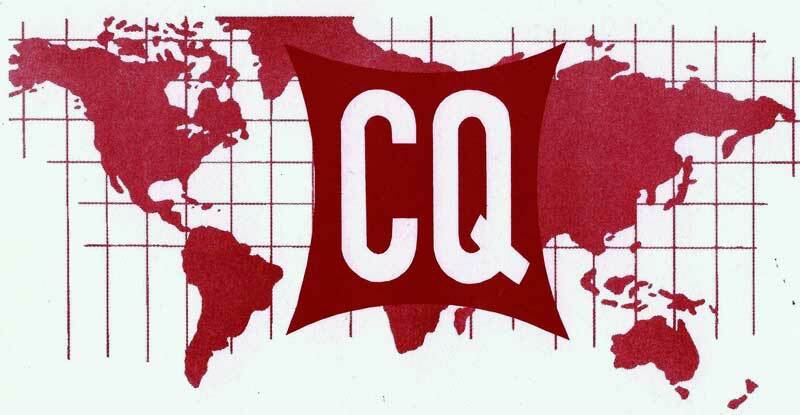 The CQ WW is the largest Amateur Radio competition in the world. 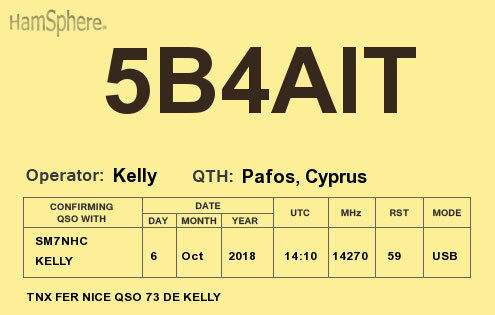 Over 35,000 participants take to the airwaves on the last weekend of October (SSB) and November (CW) with the goal of making as many contacts with as many different countries and CQ Zones as possible. There are hundreds of Amateur Radio contests to chose from every year and you can always find a contest that suits your specific Ham Radio activity whether it is CW, SSB or other modes. Fox hunting or actually ARDF (Amateur Radio Direction Finding) is a more "technically correct" is a fun sport where small transmitters are hidden usually in a forest area. There is an international standard calls for up to five hidden transmitters making brief transmissions in rotation. Each transmitter sends audible tones: first the Morse Code letters M (dah-dah) and O (dah-dah-dah), followed by a letter E (dit), I (dit dit), S (dit dit dit), H (dit dit dit dit), or 5 (dit dit dit dit dit). The hunter listens for the number of "dits", one through five, and knows which transmitter's signal is being received. Radio direction finding and fox hunting can be great fun and is a popular activity with amateur radio (ham radio) enthusiasts. Here to the left is an example of a Fox Hunting antenna. 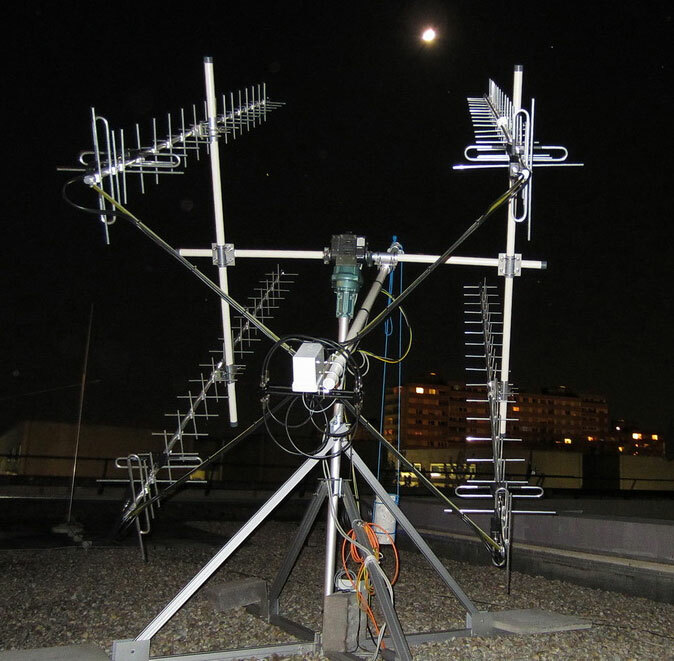 It is a simple 3 element yagi-antenna which can be used to pinpoint the location of the foxes. On the right we see a more advanced antenna based on the TDOA technique (Time Difference On Arrival) which can be used even in a high signal strength environment. You will find fox hunts organized by Ham Radio clubs most weekend, in cities and towns all across the world. Ham Radio operators gather on hilltops for the Fox Hunt contest. Sound simple? It can be very challenging and a whole lot of fun. 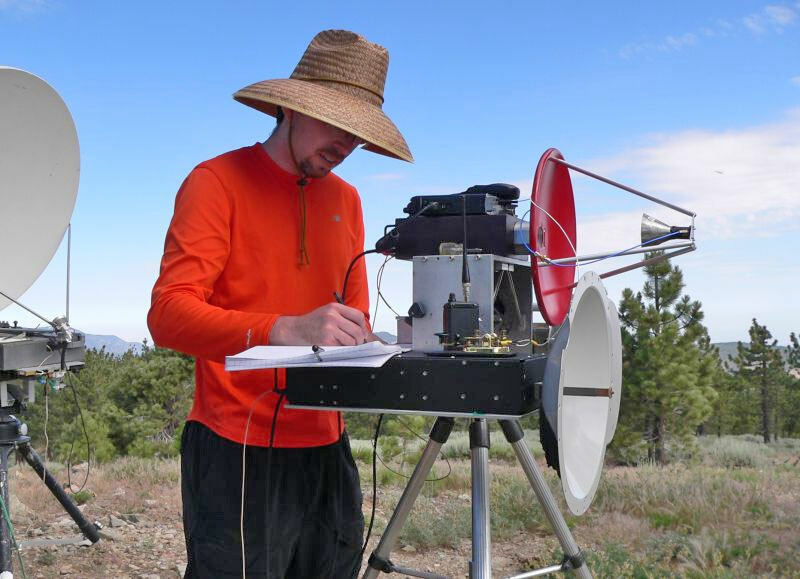 The direction finding skills learned in this activity can be very valuable in locating a repeater jammer, or a lost hiker. 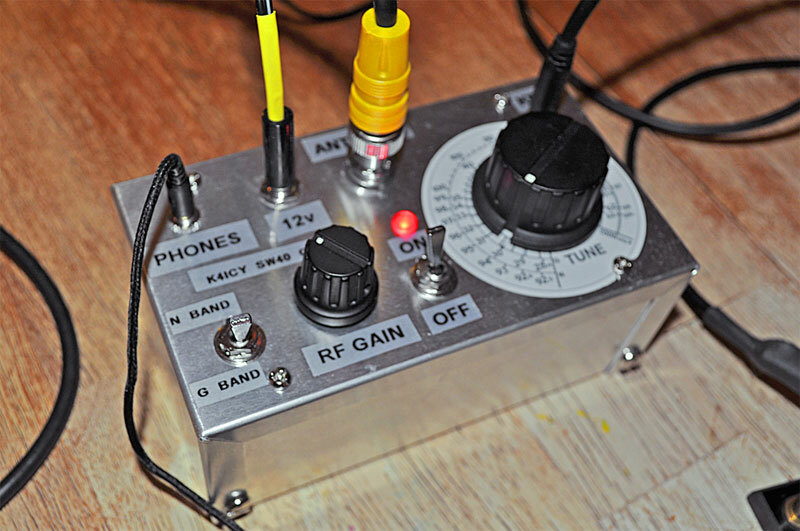 In amateur radio, QRP operation refers to transmitting at reduced power while attempting to maximize one's effective range. The term QRP derives from the standard Q code used in radio communications, where "QRP" and "QRP?" are used to request, "Reduce power", and ask "Should I reduce power?" respectively. The opposite of QRP is QRO, or high-power operation. Some believe that the power should be no more than 10 watts peak envelope power (PEP), while others strongly hold that the power limit should be 5 watts. 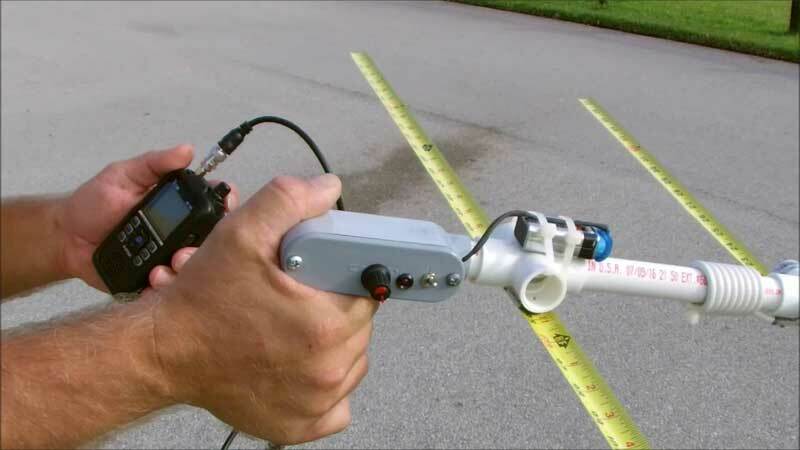 QRPers are known to use even less than five watts, sometimes operating with as little as 100 milliwatts or even less. Extremely low power—1 watt and below—is often referred to by hobbyists as QRPp. Many of the larger, more powerful commercial transceivers permit the operator to lower their output level to QRP levels. But the QRP arena is one of the few places where the average home-brewer still can make a decent showing. For QRP operation, you must be able to find DX stations, be aware of when and for how long bands will be open and have a crisp and clear setup on both CW and SSB. You must be able to quickly assimilate a DX operator's technique. One of the primary skills QRP operation strengthens is patience. With QRP power levels you have to wait for the right moment and make your move. This means you must be alert and listening rather than transmitting. You have to be familiar with the bands, operating procedures of DX stations and other QRP operators. All this takes a bit of patience, practice and listening. Amplitude Modulation on the Ham Bands! 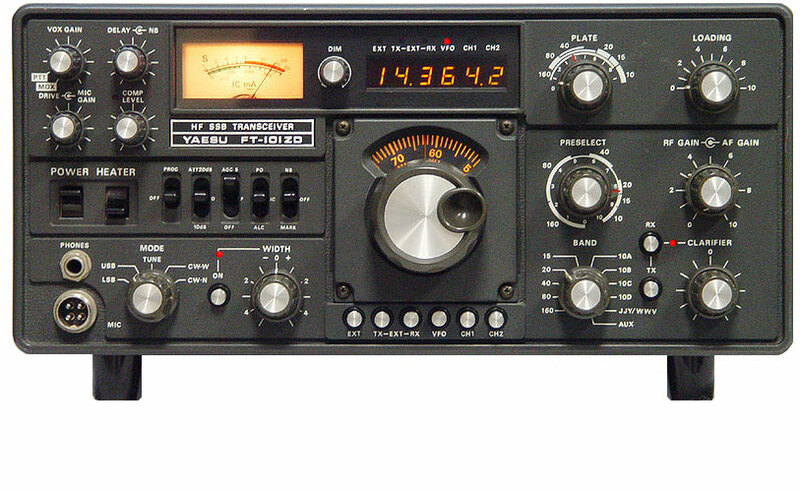 AM was once the main voice mode in amateur radio. Now it is a well regarded specialty within the hobby. AM offers a warm, rich audio quality that provides for more personal interaction. The simplicity of AM circuit design encourages hands-on restoration, modification and homebrew construction to an extent no longer found among contemporary radios. 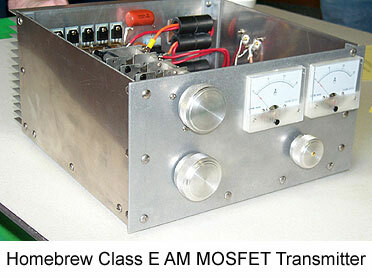 AM:ers are usually using homebrew class E transmitters with high efficiency, reliable, solid-state transmitters. Many Ham Operators show fascination for good quality AM and it has almost become a "hobby" within the Amateur Radio hobby. 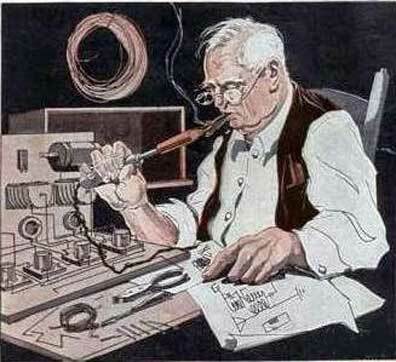 CW radio communication by Morse code was the only way to communicate for the first decade or more of Ham Radio. It is a transmission mode where the transmitter's carrier is keyed in sequences of long and short periods thus producing an audible tone in the receiver. CW used to be a requirement for the Amateur Radio license, but has in most countries become non-compulsory. CW is till a very popular mode among radio amateurs and in these low sun spot cycles it is easy to understand why. CW is more efficient than SSB. Without a doubt, CW is more efficient than phone. The bandwidth needed for a CW contact is on the order of a couple hundred Hz versus a couple of kHz for a SSB contact. CW also get more points in some contests. If you want to learn Morse code you should start by understanding that it will take DAILY practice. If you skip a day or two in your study to learn Morse Code, it will be similar to "taking 2 steps backwards, and 1 step forward". The net gain will be a deficit. There are 2 major ways to learn CW: the Koch method and the Farnsworth method. The Koch method is to learn the CW characters at the desired speed you wish to use it on the radio. You start off with 2 characters and once you have about 90% recognition you add another character. The Farnsworth method keeps a high character speed and spaces the word speed out. By this the sounds, or elements (the dits and dahs) of the individual characters are sent at an approximate speed that you might hear from others in use on the radio. Download a software program called NuMorse at www.nu-ware.com This program is actually shareware, but will work just fine to teach you the Morse code characters. 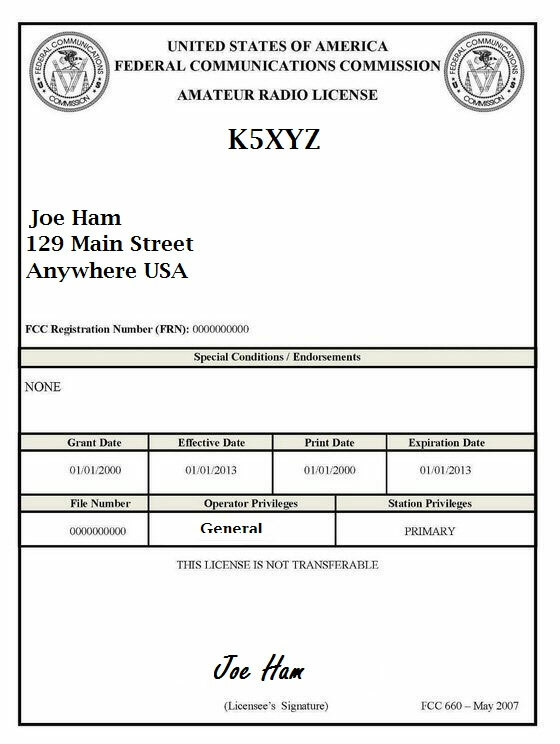 There are "certificate chasers" on the Ham Radio bands who work for certificates that demonstrate how good an operator or how good their station works. Such as worked All States (WAS) award shown to the left. An award is earned by the Ham Radio operator for establishing two-way communication (or "working") with other amateur radio stations. Awards are sponsored by national amateur radio societies, radio enthusiast magazines, or amateur radio clubs, and aim to promote activity on the amateur radio bands. Each award has its own set of rules and fees. 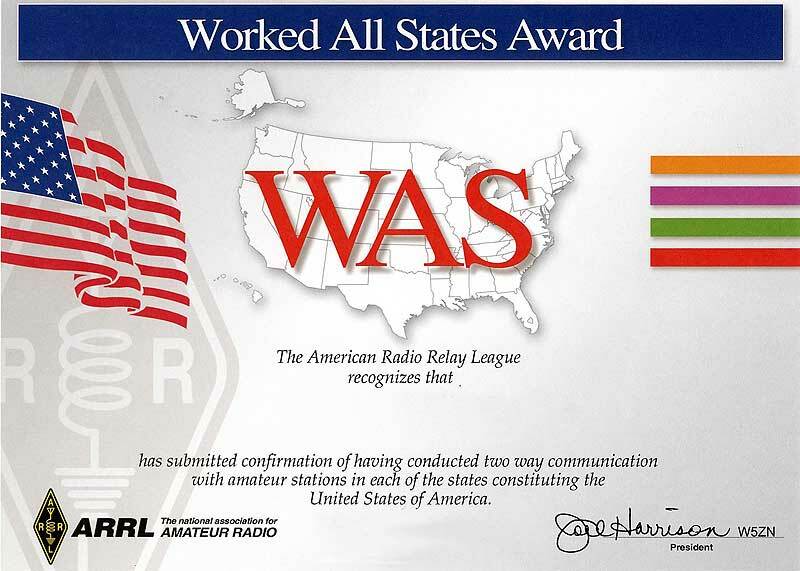 Some awards require the amateur radio operator to have contacted other stations in a certain number of countries, Maidenhead grid locators, or counties. 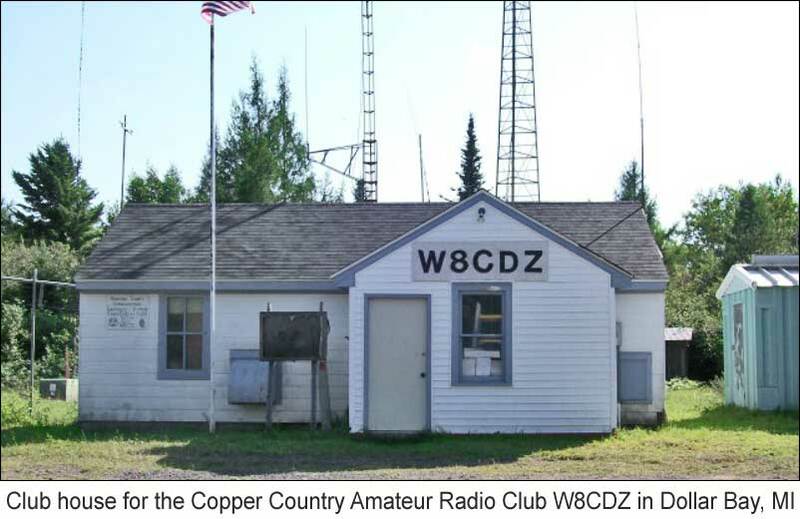 Because amateur radio operators are forbidden by regulation to accept financial compensation for their on-air activity, award recipients generally only receive a certificate, wooden plaque, or a small trophy as recognition of their performance. SOTA is an amateur radio operating award program launched in Great Britain in 2002. SOTA's aim is to encourage licensed amateur radio operators to operate temporarily from mountainous locations, combining hiking and mountain climbing with operating their amateur radio station from the summits of hills and mountains. For many years, in the U.K., the events of this weekend have been shared with amateur radio stations and became known as the ‘Mills on the Air’ weekend. This event has proved to be an excellent way to advertise the hobby of amateur radio to the many members of the public who visit the mills and pumping stations. This is usually an annual amateur radio event where Ham Radio operators have QSOs from lighthouses around the world but could also be run as special events. There are about 50 different lighthouse awards around the world the Ham Radio operators can qualify for. Railways on the air (ROTA) weekend usually takes place every year on the weekend closest to the 27th September in the UK. One of the favorites is "Ragchewing" which means just sitting around talking to another Ham, often many miles away, and just sharing stuff about our hobby. The thrill to talk to somebody in a far off place is usually what driving the Ham operator. Ragchewing is one of the most popular ham activities and it means to simply chatting about nothing in particular. In other words, chewing the fat, or in ham jargon, 'Rag Chewing'. Based on this popular activity, it seems only right that rag chewing should be acknowledged as a truly ham activity. For anyone not familiar with the term, rag chewing isn't just contacting someone. It involves actually conversing, talking and listening for more than 30 minutes. A Ham Radio net is a gathering of amateur radio operators on the air.. Most nets take place on a regular schedule and specific frequency and are organized for a particular purpose, such as discussing a common topic of interest, relaying messages, emergencies, or simply as a regular gathering of friends for conversation. The net is like a chat room of the airwaves where one person talks at a time. The operator who are in the position of "Net Control" dictates whose turn it is to speak. This reduces the risk of multiple people talking simultaneously. There are two kinds of nets, formal and informal. Formal nets meet with the purpose of discussing for example, traffic nets that will handle formal written traffic like practicing emergency communications. It is rare to hear someone talking private things during a formal net as that is best suited outside the net. Informal nets operate with a little more flexibility. It could be the topic of the day and some fun trivia. It offers local operators an opportunity to share their daily stories with everyone and have a little fun. Some informal nets might offer help to new hams, where local operators can contribute. Nets can be found of both HF and VHF/UHF. Local Nets are usually performed on repeaters or on 80m HF band where it is easy to communicate shorter distances. Homebrew is an Amateur Radio slang term for home-built radio equipment to allow experimentation with different techniques. 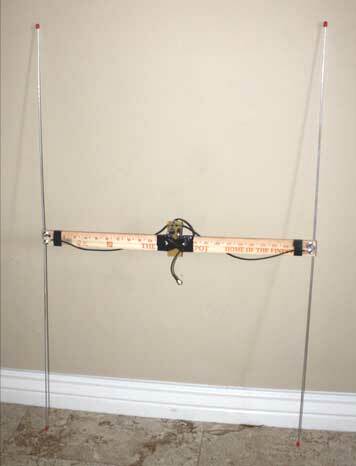 Making your own antennas, the simple Dipole antenna, long wire, J-Pole etc is also a fun project. Some items can be home-brewed at similar or lower cost than purchased equivalents. Building stuff like digital Ham Radio interfaces to the computer and enjoying solder and the smell of hot resin can be a thrilling experience even today. Slow Scan television (SSTV) is a picture transmission mode to transmit and receive static pictures in monochrome or color. There are several slow scan television frequencies allocated on the HF bands. These channels are normally reserved for SSTV, although there is often some interference from nearby SSB stations. IARU recommended frequencies are 3.735, 7.040, 14.230, 21.340 and 28.680 MHz. It is common to start to establish an SSTV contact by first making contact on SSB. Once contact has been reliably set up, then it is possible to move to SSTV when both stations are ready. The SSTV community is quite big and many Ham operators enjoy this mode. The pictures can be transferred relatively well even in bad and noise conditions. Today there are many good software for SSTV where the most polular one is MMSSTV by JE3HHT - Makoto Mori. 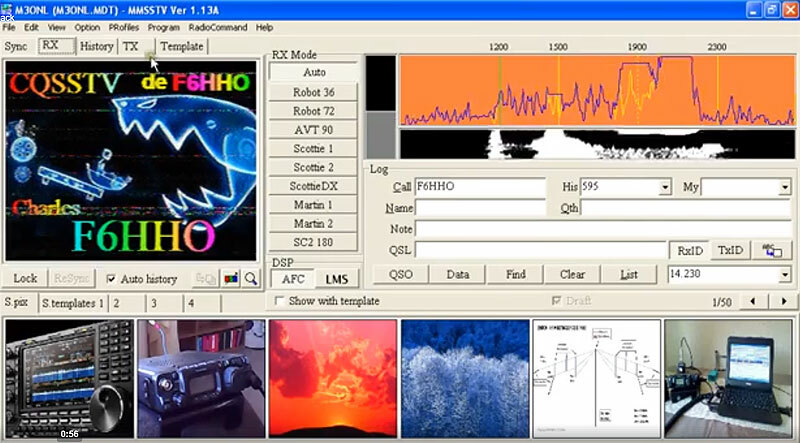 SSTV can be sent via different modes such as Scotty, Martin, Robot etc. The software usually detects the mode automatically. The picture above is showing MMSSTV in action used by M3ONL receiving a picture from F6HHO. An amateur radio repeater is an electronic device that receives a weak or low-level amateur radio signal and retransmits it at a higher level or higher power, so that the signal can cover longer distances without degradation. Many repeaters are located on hilltops or on tall buildings as the higher location increases their coverage area, sometimes referred to as the radio horizon, or "footprint". The common thing with these repeaters is that they have an offset between receive and transmit frequencies. For FM repeaters on the 10m HF band the offset is 100 kHz whereas on 2-meter (145 MHz) the offset is usually 600kHz. Some repeaters need a short burst of 1750 Hz tone to open the repeater. The FM repeater activity has however declined worldwide and most of the traffic is now carried via Digital Ham Radio DMR instead. But the paradoxical thing is that many repeaters are now D-Star enabled so they serve even Digital DMR radio. Many repeaters have also been connected in the Echolink network for many years. Microwave Amateur Radio is a hobby within the Ham Radio hobby. Amateur Radio operators are licensed by the government to transmit signals in selected bands across a broad spectrum from as low as 1.8 MHz all the way up to 250 GHz! Nearly all Microwave Amateur Radio enthusiasts build radios at some point, but many start off by borrowing someone’s spare radio to get started. This enables the first-timer to get on the air and experience microwave radio first hand. Contacts are usually voice (single-sideband suppressed carrier) or CW (Morse Code). A key feature of microwaves is that the higher antenna gains can give considerable distance but do have narrower beamwidths. Therefore being able to repeatably point the antenna in a known direction becomes important. Beacons are a vital resource on the microwave bands, providing frequency references, direction references and propagation indicators. In addtion to standard reference information, a useful resource is the Beaconspot website which extracts beacon reports from the DX cluster and maps their reception distances. Propagation Issues with EME. The Moon orbits the Earth approximately once every 28 Days in a slightly elliptical orbit. At Perigee (the closest the Moon approaches the Earth) the 144 MHz path loss approaches 251.5 dB; at Apogee the value reaches 253.5 dB. Believe it or not, this 2 dB variation can mean the difference between completing a QSO or not when other factors drive signal levels down. 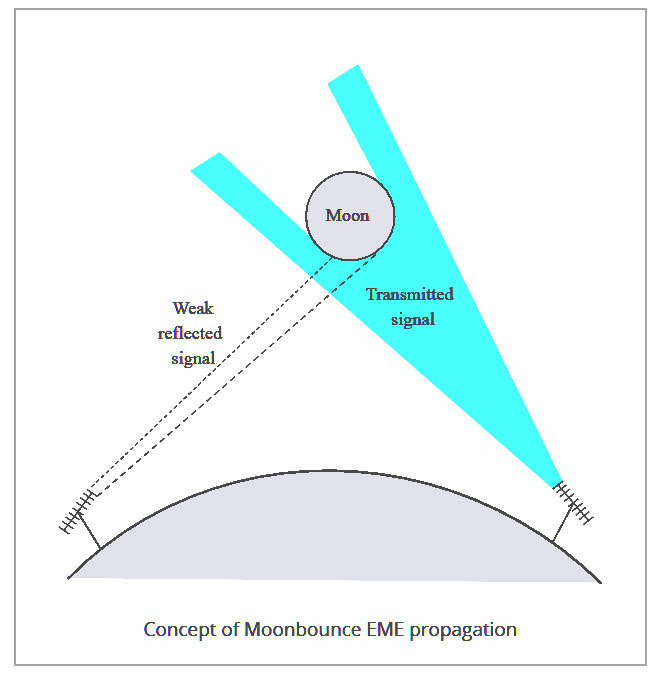 There is a random fading effect on signals received off of the Moon caused by the rocking motion of the Moon and the signal wavefront bouncing off of the Moon’s jumbled surface and taking on an irregular shape itself. For sure EME is a challenge but can be done with relatively low budget. Ham Radio satellites have bent sent up in space since the 60's. The most famous ones are the OSCAR satellites where the oldest active satellite is OSCAR 7. It was launched in 1974 and it is still active. Satellites have an uplink and a downlink usually on 2m or 70cm. One of the most popular satellites to use is OSCAR 50 or SO-50 as it is called. 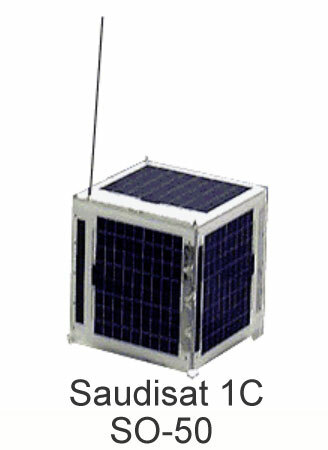 The original name is Saudisat 1C that was launched from Russia in 2002. It works as an FM repeater using FM modulation. It is operating on 145.850 MHz uplink and 436.795 MHz downlink. There are many YouTube videos demonstrating the SO-50 in action and it is relatively easy to make QSOs through it. Most countries amateur radio licences allow licensed operators to install and use radio transmission equipment while at sea. Such operation is known as maritime mobile amateur radio. In most cases the operator's call sign needs to be extended by adding the suffix "/MM" when transmitting at sea. 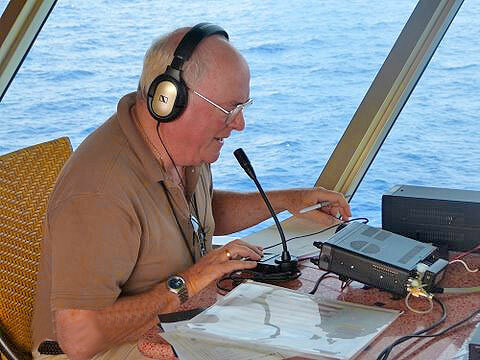 Because HF Radio operates over a longer range than VHF Radio it is highly suitable for long range communication between groups of cruising sailors who may be spaced far apart over the oceans. There are a number of HF Radio Nets for marine use are set up and run by "controllers" all over the world (Indian Ocean, Atlantic, Mediterranean, Pacific, etc.) to handle and co-ordinate this traffic from vessels sailing the oceans. It is important for cruising yachts to know these radio net frequencies and times so as to pass message traffic, log positions, receive weather information, etc. 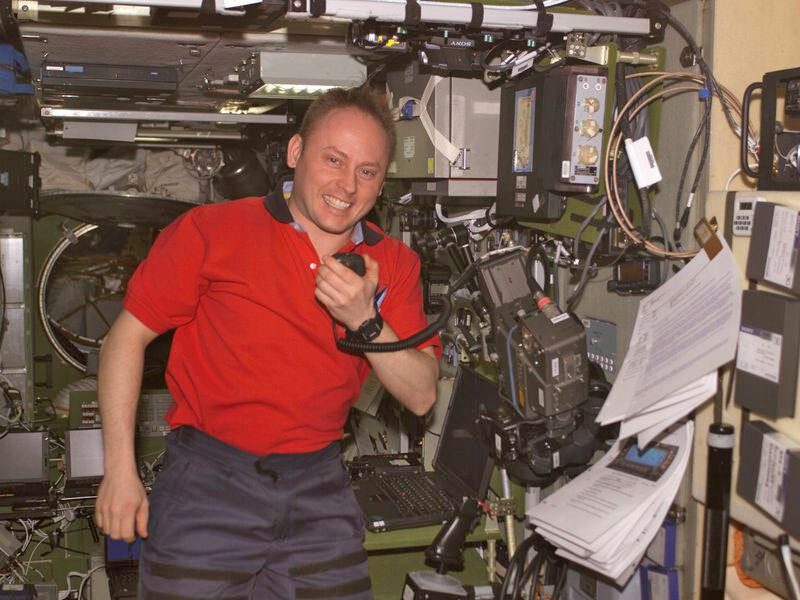 When astronauts, cosmonauts and mission specialists from many nations fly on the international space station, they will have amateur, or ham, radio as a constant companion. The ISS radio transmits signals at 145.80 MHz and receives signals at either 144.49 or 145.20 MHz, depending on its orbital location. 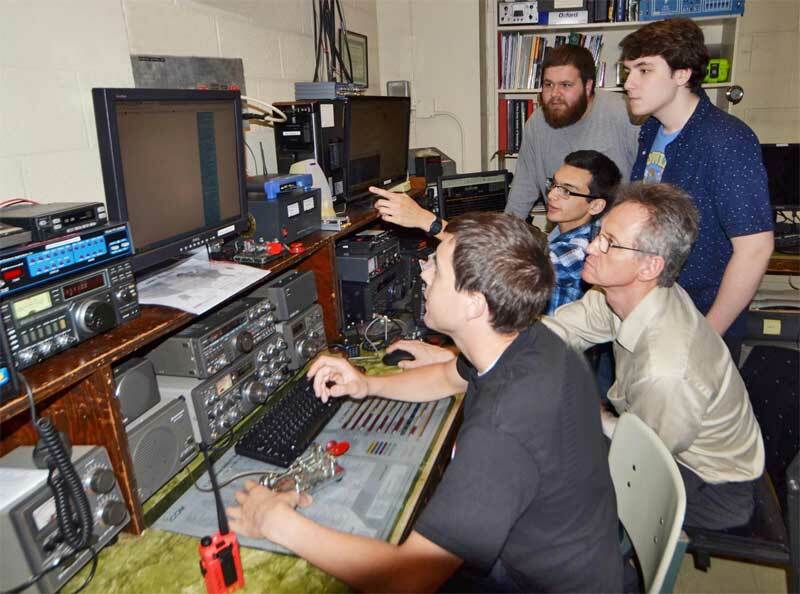 Most school groups chosen to participate in the ARISS program set up a temporary ground station in their schools, often with the help of local amateur radio volunteers. The ISS is in a very low orbit and so is only in range 5 or 6 times each day and then only for a maximum of 10 minutes on the best orbit. This means you need to make sure you’re listening at the right time to hear it. Hams have been putting stations in their cars since the 1920's. Today, there is great satisfaction in facing the challenge of installing a transceiver in our small cars and pick-ups, using somewhat inefficient antennas, and still being able to make contacts with hams thousands of miles away while "tooling" down the highway. Another clear need for mobile operation is for those facing antenna restrictions in their homes. For these folks, ham radio is not a total loss since a mobile station will allow them access to choice locations such as hill tops from which to pursue their hobby. Selecting the right mobile antenna for HF radio applications is utterly crucial, as it is what enables effective transmission and reception. One of the problems with HF mobile operation, especially on 160, 80 or 40 Meters is antenna efficiency. The base loading coil has to be mounted on a strong enough mount to take the normal flexing seen during mobile operation. Typically, the spring for the whip mount would be above the coil, allowing the whip to move without putting undue stress on the coil. 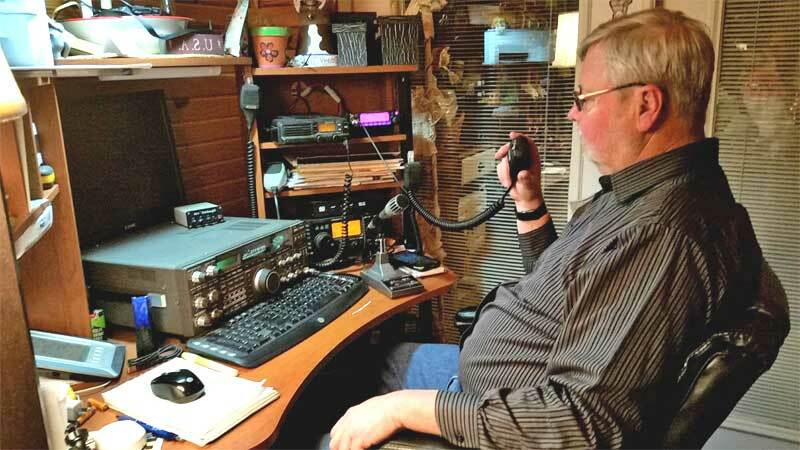 Over recent years in the wake of VOIP technology, a new phenomenon has surfaced within the Ham Radio hobby namely Remote Ham Radio stations. Operators around the world offer their hardware, rigs, amplifiers and antennas to be remotely controlled by other Ham operators. This is usually done by commercial interests and offers a possibility for operators to experince state of the art setups with kilowatts of powers and massive beam antennas. The biggest provider is called RemoteHamRadio.com and they offer “Time-share” remote stations in different locations. It is fairly easy to setup your own remotely controlled Ham station with existing hardware and interfacing provided by for example RemoteRig.com. For example you could remotely control your Ham shack from your summer house or your mobile. The possibilities are endless. Remote operating is becoming very popular. More radios support it, more software is available, and high-speed Internet is available in more places than ever. You’ll have the option of building a traditional home station and be able to operate it from wherever you are. Some clubs and informal groups build and share a remote station. This is an exciting time! 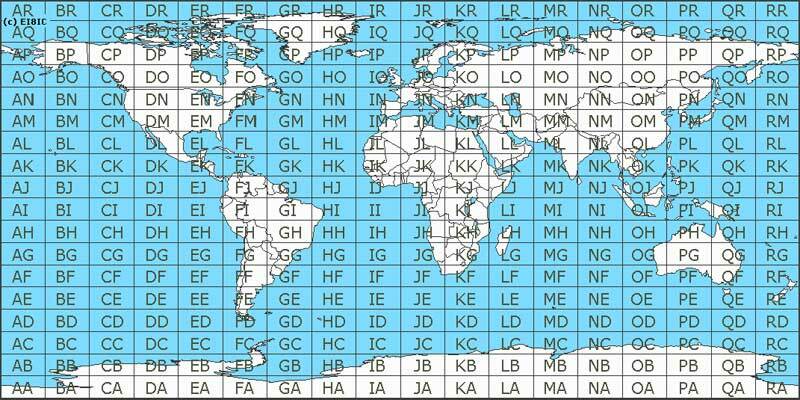 Ham Radio operators often use Grid locators to indicate their locations. The Maidenhead Locator System (a.k.a. QTH Locator and IARU Locator) is a geographic co-ordinate system used by amateur radio operators to succinctly describe their locations. Its purpose is to be concise, accurate and robust in the face of interference and adverse transmission conditions. The Maidenhead Locator System can describe locations anywhere in the world. Grid "squares" are distorted on any non-equirectangular cartographic projection. Here to the right you can see the grid squares of the entire world. A DX-pedition is an expedition to what is considered an exotic place by amateur radio operators, perhaps because of its remoteness, access restrictions or simply because there are very few radio amateurs active from that place. This could be an island, a country, or even a particular spot on a geographical grid. DX means distance in Ham lingo. 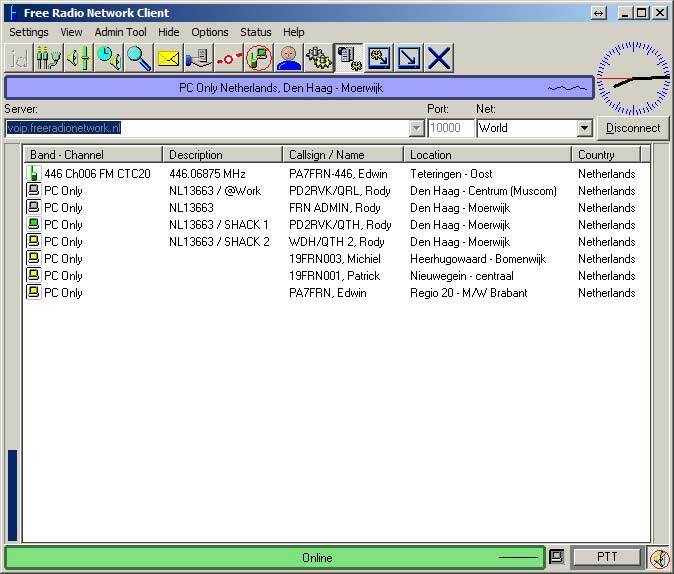 A DX Cluster is a means for Amateur (Ham) Radio operators to tell each other, in realtime, about DX stations (other interesting or rare Amateur Radio stations all over the world). The DX Cluster is a world wide network of connected computers where users are logged in and placing "DX spots". A DX spot is a piece of information sent from one station to every other one logged in on the DX Cluster, in real time. First the operator log in to the DX Cluster with its call sign. The columns are usually: Spotter, frequency, DX Station, additional information, time and locator. The spotter is the station who put the spot or announce on the DX Cluster, and the locator is the locator of the spotter. The biggest and most reliable DX Cluster has been the DXSummit (www.dxsummit.fi). 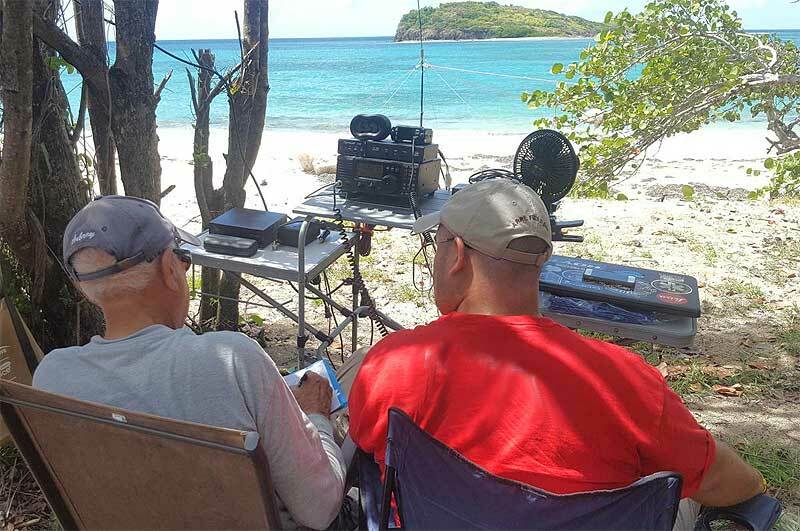 This renowned DX Summit by OH8X has been a reliable source of current and historical DX activity on radio for many years. * Ham Radio expands your knowledge of earth and space science. * Sometimes it needs uses for high school math or high school physics. * The ultimate way to keep in touch with faraway friends and relatives. SDR stands for Software Defined Radio which means that the received signal is processed by computer software. SDR HF transceivers are fairly popular in HAM radio these days. 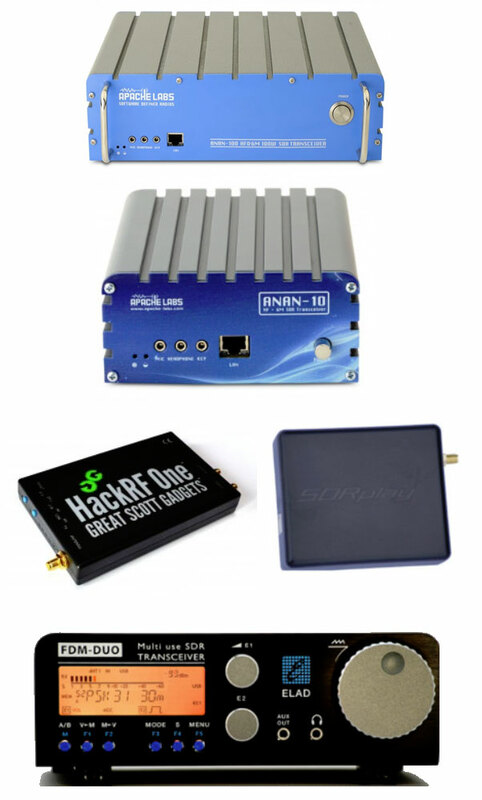 Almost all new Ham Radio commercial transceivers are built around some SDR implementations, but there are some pure SDR HF transceiver hardware out there such as Flex Radio, Elad, Apache Labs, SDR Cube, GenesisRadio, SoftRock. Many of these come as kits, where you can build them yourself. Once you have your SDR hardware running you can connect the software. There are plenty of SDR software around compatible with the mentioned hardware such as PowerSDR and Winrad. The key component of SDR is the ADC (analog-to-digital converter) which is hardware based. There are also some open source transceivers such as OVI-40 based on a new open source that is a pure DIY (Do It Yourself) SDR ham radio transceiver project. One of the most interesting hardware is the HackRF One SDR Tranceiver which covers 1MHz to 6GHz in all available modes, analog and digital. To the left: Picture of the PowerSDR software in action using Flexradio. PowerSDR is produced by FlexRadio to work with their SDR devices but it has been ported to support other external ADCs such as Mercury and Excalibor boards. Since the development of VOIP (Voice over IP = Internet) Amateur Radio has evolved, especially in the times of low propagation caused by the non existing sun spots. Nowadays you will find clever Radio/Internet combinations such as D-Star, Fusion, C4FM, P25, DMR (Digital Mobile Network), EchoLink, IRLP etc. These communications are always done through a combination of using a real Ham Radio band and the Internet. The two biggest DMR networks are called BrandMeister(TM) and DMR-Marc using the Motorola TRBO protocol. In the world of DMR, there are two ways to gain access to the now worldwide network. One is a repeater, the other is using a Hot Spot. Which method is best is determined by several factors. The Brandmeister Network is the commonly associated with Hot Spot operation, while the DMR-MARC network is associated more with repeater operation. Some operators create "homebrew" DMR hotspots using so called DVMega modules. Usually consisting of a Raspberry Pi 3 computer and the DVMega RPI single-band UHF radio module. The outputs of these spots are usually very low like 10 mWatts using the 70cm band. But isn't there any Digital Ham Radio systems without using radio waves? Probably not. Today we are using our lap-tops and mobile phone and they are usually connected via wireless WIFI or 3G/4G mobile Internet so everything is radio. There are a few systems that do not require a real Ham Band to carry the voice. These are HamSphere, FRN (Free Radio Network) and CQ100 etc. Yes and no. On September 11, 1958 the official Citizens Band (CB) was created on 27 MHz in the USA. Most countries had different use of the band at the time and some countries even forbid use of the 27 MHz band. In the 1970's the CB activity boomed all over the world and in some countries you could apply for a permit, but these permits where usually not applied for and many people ignored this requirement and invented their own nicknames. Italy was one of the countries where CB took off rapidly during the 70's. 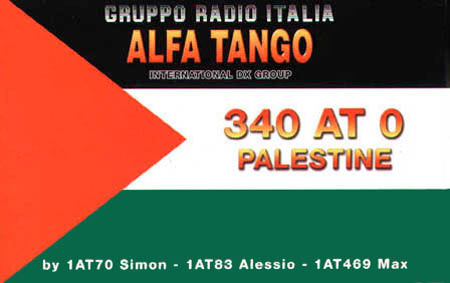 The most famous CB Club in Italy Alpha Tango started to number each country in the world beginning with 1AT (One Alpha Tango) which was the number for Italy. Today this list consists of 351 countries and entities and it is still in use as the official 11m prefix list. Today the CB band is in wide use all over the world and it is usually license free. OK. But what if I don't want the fuzz about bulky transceivers, antennas, licenses or radio in general but still want to talk to Ham Radio operators or enthusiast. What can I do? Well, then it sort of boils down to two systems, FRN (Free Radio Network) and HamSphere. 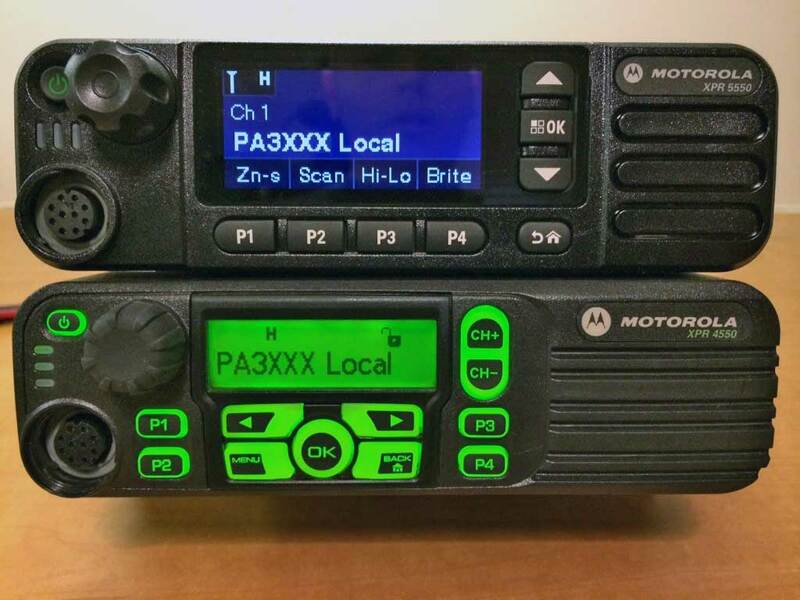 This system allows any operator, licensed or unlicensed to communicate in a Ham Radio way within the FRN network with just a PC or Android client. The network consists of both radio interfaced units and PC clients using gateways re-transmit the received signal. Clusters of gateways can create so called Nets. All communication is using VOIP. This system is based on two networks; HamSphere 3.0 and HamSphere 4.0. It allows licensed Ham Radio operators as well as unlicensed radio enthusiasts to communicate with each other. 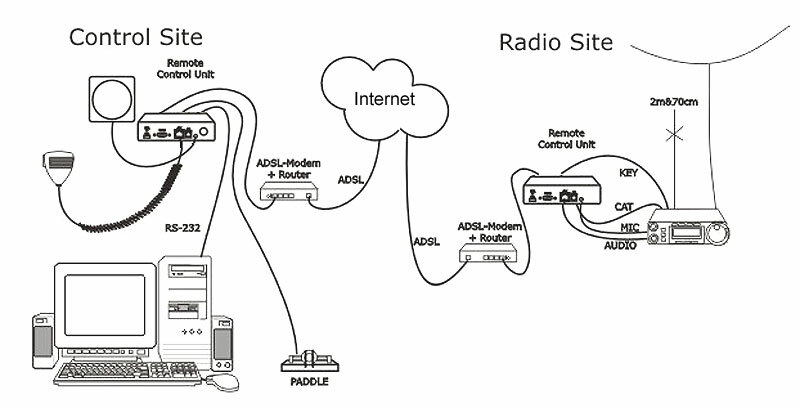 Both systems consist of 15 simulated shortwave bands and communication is done using client/server base. The product encourages unlicensed enthusiasts to get their own license. There is a significant difference between the two networks where the more advanced HamSphere 4.0 is a modular system where the operators design their own transceivers and communicate using NEC designed antennas (Numerical Electromagnetics Code) and realistic shortwave propagation. The 3.0 platform is targeting mostly beginners. HamSphere is subscriber funded and offers a 30 day trial. The subscription can be either 3 months or 1 year, recurring or non-recurring and costs less than 10 cents per day. For more info on HamSphere subscriptions, click here! 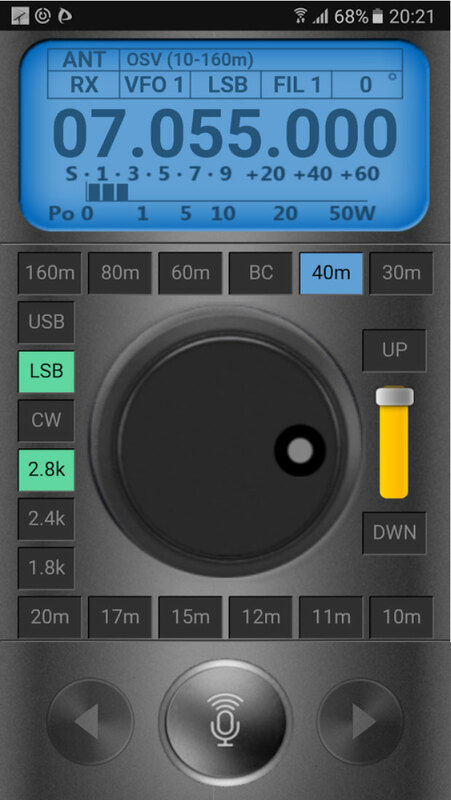 HamSphere 4.0 also comes as an Android version as seen on the left based on the same modular plug-in design. It is using the same network, but with a different set of antennas and functionality.